"Hey Moto, did your girlfriend come to school today?" "Oh, I heard she was cutting class again!" "So, Moto, where's your girlfriend?!" If you heard these clowns, you are probably wondering who they are talking about and who they are talking too. Well, let's start things off freshly, my name is Isadore Moto, Izzie for short. Yeah, I know it sounds like a silly pet name that a toddler would give to her hamster. I digress, my parents aren't very fond of modern names. Anyways, I am in ninth grade. I have hassle green eyes and short, messy light brown hair. My mom and my younger sister always get on my case on how I look like a hobo. Anyways, I am a student at Watson Tanner High. The school was named after a Confederate General, but that's much as I know. The guys that are talking to me are from my class and they have me pinned against the wall as usual. Jason Yuki is the leader of these thugs. He looks like a smart guy from the outside, especially with his thick glasses. However, don't let his appearance fool you; he's an idiot! The bell rang and school is officially over now. Jason has me pinned against the wall while his goons block the staircase and keep a look-out for the teachers. Yeah, you'd think with a school full of 2,573 students that somebody would keep tabs. That's where you're wrong. "Hey Moto, where's your girlfriend?!" Yuki says as he holds tighter onto my collar. I don't look at him in the eye and this ticks him off even more. "What's wrong?! Are you trying to protect that B****!?" Yuki has a very influential vocabulary, well if you consider cussing influential. He has his fists about to concave with my face. Fortunately, I am saved by one of the teachers. She comes down the stairs and Yuki lets go of me. He runs off with his thugs; hoping that I'll take the blame. The teacher yells at me about how school's over and that if I don't leave, she'll write me up for trespassing. It's no use explaining what just transpired, because like the students; the teachers are idiots too. I am now in the woods, well taking my short-cut as usually. "Ami, why didn't you come today?" I ask myself quietly. Ami or rather Suri Ami is in the same grade as me. She looks like your stereotypical Shojo girl, but she has a temper that you don't want to mess with. Last time, I messed with her. She threw me into the wall; it took the school some money to fix the large hole. I keep trudging through the forest. It's now nighttime and I think I'm lost! I see someone ahead and I think it's Suri. I call out her name, but she walks into a tree. However, now I found myself in a bigger fix. I fell in a hole. My leg, I think I sprained it. I can't move, because it'll only make it worst. I call out for help, but nobody's coming. Will I die here?! By the way, guys, this is an original story. Well, mostly. I hope you guys enjoy, because I made the cliffhanger opening and I have no idea where this story is going to go. Anyhow, I'd like to know more about Moto, and his girlfriend. I also want to point out, you might want to be more descriptive, instead of jumping the gun to having Moto being beaten up, and not stating more than an average day of being harassed by school bullies over his girlfriend; which we don't know much about. And is Moto's luck, really that bad? I digress. Good to see you writing something new, and look forward to knowing more. Bio: He wears a uniform that is holly green. Not really the smartest in his class; that title belongs to Jason Yuki. He is a Tabula rosa (Clean Slate). Bio: She is a childhood friend of Is and enemy of Jason Yuki. She likes to cut class a lot, which gets Is in trouble a lot. It feels like I have been here forever and nobody still has come. I got through the night with the lunch my mom packed and using my gym clothes as a blanket and my backpack as a pillow. I am still waiting for somebody to come and it looks like my waiting is about to come to fruition. There's footsteps, well they sound like some sort of coyote or dog or something. There's another set of footsteps, these ones are kind of light, but somewhat heavy. It's too light to be an adult man's and it's too heavy to belong to a child. My heart feels like it is in my throat. I eventually woke up in a strange place. The curtains were scaly and the floor was hard as stone. The bed was just a pile of scales and feathers. My clothes were gone and only a tunic covered me. I screamed and the door to the strange room opened. A girl that looked similar to some sort of lizard walked into the room. She carried a tray of fruits and soups. They were set on the night stand next to my 'bed'. I looked at her and she just turned tail and walked out of the room. I went to pick up the bowl of soup that had some sort of green vegetables, possibly celery floating in it. The hot liquid made my mouth dry and I could only gurgle it down. I felt like my mouth was on fire and sucked my thumb; hopefully that will quell the hotness. A hand reached up the concrete tiles that made up the floor. He held up some container of water, so I wouldn't go thirsty. I asked him what it was and the voice belonging to the hand just shouted, "JUST TAKE IT!" I didn't hesitate; I didn't want to anger the ghost any further. This place I was in...is so weird. I am just wondering where Suri is. Will I get home ever again?! If you didn't think the spectral hand, the lizard servant girl or the stranger with his monster cat were not enough, it turns out that I am in some sort of prison. Yes, I said it, prison. P-R-I-S-O-N! Of course, there are no bars on the windows, but don't let it fool you. There's something that keeps me from escaping. Every time I tried smashing something, rather it be a chair, my fists or anything that I can pick up with my bare hands; the glass never breaks. I hear cackling outside and the metal doors to my room slam open. Two guards enter my room and I cannot see them. It is freaking terrifying! I try punching them in the stomach, but it feels like I am punching a brick wall and my fists hurt! I'm lead out of the dingy room by one of them. He or she or whatever it is has really rough skin like sandpaper. I am tied by something unseen, which feels rough. However, a different type of rough like a rope, which is also thick. Of course, I cannot see anything, because like I said earlier; the guards are invisible! I can hear cackling, screaming, and wailing as I am lead through some long hallway. Several voices shout out to me for help, but I am no use to them. I hear a loud roar as what I perceive as a drawbridge is bringing brought down. The guards push me forward and from pitch darkness, I am in now pure light. My eyes cannot take it! The lights get dimmer and suddenly I am pushed to the dirt floor by the hilt of a broad sword. I turn around and my eyes take a long time to adjust. There is a girl and I instantly think of Suri. She has the same medium length brown hair and the same dead-set brown eyes as Suri does. Her skin also seems to be about the same shade; pale brown. However, there is one thing that separates this girl from Suri; the armor. The armor is something that you would expect to see from the Middle Ages, but it's not heavy. The girl points the tip of her broad sword to the edge of my throat. "What are you doing here?!" she demands. I stutter and stutter and she just seems to roll her eyes. She doesn't withdraw her sword from where my thyroid is. I am sweating and I am feeling rather pale. "I-s-a-d-o-r-e!" I say with enough oxygen that doesn't allow me to faint. She glowers at me and kicks me in the stomach. I am knocked into some weapons and she walks up to me. "Isadore, from what land do you hail from?!" I am at a lost of words. I was at first in a rural town, somewhere in the deserts of Arizona. Now, I have no idea where I am at. This Suri look-alike expects me to know where I am at! Really?! "SURI, don't waste your time on this maggot! The king wishes to speak with you. He has another assassination for you, so get a move on! One of the unseen guards that dragged me into this gym said. She glares at me and I am left on the dirt floor gawking once again. All I can think is, "WHAT'S GOING ON?!" They, the unseen guards I was telling you about...they moved me again. I am no longer in the room with the scales and feathers as a bed. I now have to share a room with somebody. There is at least a bed, well, it looks like a table. But, boy is it comfortable! My roommate is really something out of this world, well, he's a centaur. That means, he has the upper body of a lavender-skinned human with reddish-gray hair tied in lots and lots of braids. He has large eyes, sort of like you would see from the Lucky Star anime. His lower half is of course of a horse, well a tannish brown stallion. The lower half seems more down-to-earth than his upper human half, I will say that much. My centaur roommate, well he doesn't speak any language I am familiar with. I stare at him and he just seems to get more frustrated until he knocks me over. My first night with my centaur roommate didn't go so well. He kept rearing for my bed. I told him no, but he kicked me off with his back hooves. "OUCH!" I had to sleep against the slab walls last night. My new roommate couldn't even fit on the table bed, so now he's letting me have it. Literally, because he threw me on it. It HURT, but the bed feels so good! Well, the table, which I found out is a mattress, but that's aside the point. "EW AHVE OT TAGHER REBRIES!" My centaur roommate said or rather yelled. I can't understand him, but it turns out he has a friend. A little, floppy-eared, puppy girl named Lila. I learned that she has a cell or room all to herself. Why? I don't know, because she's insanely manipulative. I saw her out on the battle field today. She was going up against some crocodile monster. He had her cornered and was about to knock her out with his wooden sword. She looked at him with those pouty, large rose-gray eyes and quivering lips. Her spirally shaped tail was buried in the dirt of the arena. "Please, don't!" she said before a large, fleshy, pink hand grabbed the crocodile and threw him who knows where. I digress, Lila acts as a translator for my centaur roommate. She said his name was Belka. He is apparently from somewhere with lush meadows and ravaging springs called Elysium. He neighs and repeats the same sentence as before, "EW AHVE OT TAGHER REBRIES!" Lila just says, "Belka says, 'we have to gather berries!'" It turns out that the prison sends it's prisoners out to gather food. Herbivores, which is the group I am in; we gather berries, lettuce, and other plants. The other group is the Carnivores and they are basically the hunters of the prison. I'll tell you what, I HATE gathering! To start out with, I'm literally impressed with your imagination, and where you took the story. Now, since Isadore is fifteen, I'll let the whole "Am I going to die out here?" thing slip, since some kids do think that at a young age. [Also, didn't mean a description, more of a add into the story what said characters are like, but what's done is done. C:] Anyhow, curious what Isadore is going to do about this look alike Suri. And if, he will later assist her with assassination jobs? Belak and I were given a gray pail. You know, the type of pails that you see on farms to milk cows or goats. Well, Belak did most of the carrying, which I was thankful for. What I didn't like was him eating all of the berries we gathered. We barely had enough when we came back and one of the guards yelled at me for Belak's stupidity. I tried complaining to Lila about Belak, because the last time I offended him with the bed incident didn't go over so well. He is nothing, but muscles and fur. Lila understood me to some degree, but whenever my centaur roommate came around; she would just gulp and somehow throw a pie in my face. I feel like I am living in a cartoon sometimes! Also, Lila only takes Belak's side on everything. She sighs and then speaks in a monotone voice before going up in pitch, "Well, why DON'T you be nice to him?!" I want to argue back, but she always pulls off some tantrum. The guards come and I get thrown down a hole in what they call solitary confinement. It's dark, the rooms are very tight. All you just want to do is scream and climb your way out. Of course, the walls are too what's the word-straight. There are no imperfections or jagged edges to grab ahold of. The guards do feed me, even though it's through a tray being lowered with no forks or anything. Oh, that's one thing, I forgot to mention. Nobody in this place believes in utensils. You're just stuck eating your food with your hands or with your face in the food. I prefer using my hands, but they do at least believe in hygiene; because they make us wash our hands in some sort of bubbly liquid that sprays everywhere and it stings like that anti-bacteria disinfection at your local store. We are then given a rag to dry our hands off with before they are taken away. I do like it down here, because there isn't any annoying Lila, Belak, guards or anyone else to annoy me. I get to skip out on the scavenging, farming and hunting of the Herbivores and Carnivores. I don't have to participate in the grueling exercises of the arena where prisoner is put up against prisoner. I don't have to deal with loud neighing and rearing at night. And, I have three square meals a day, even though they taste like mud. Unfortunately, my 'vacation' got interrupted today. Belak is now going in confinement for getting into a fight with one of the guards. So, I am back to the daily, boring and irritating routine of prison life. Plus, I am still trying to get answers to where I am actually at and why I was brought here. I still have no way of going back home, even I am still on earth or not. Hiya, this is Lila here. I am taking over for Izadore, well I'll call him Issie, because that's so much cuter. KAWAII!!! Don't believe what Issy says, he's a phony baloney. Even though, he's so cute at it!!! Anyways, you're probably why I am mad. Well, that's simple! I got stuck with that icky Bakeneko, Luka! EW!!! I am a dog demon, well actually a Ghoul Hound, even though my species' name sounds so UN-kawaii!!! If you are wondering what a Bakeneko is, they are actually demon cats. They still lack in comparison to my badly named species of Ghoul Hounds. I STILL CAN'T BELIEVE I AM STUCK WITH HER!!! Call me annoying if you want, I don't care!!! Aside from Cutie Izzy, Icky Luka and Grumpy Belak, I got here due to running away from my silly daddy. Does he seriously think I am crazy?! DO I LOOK CRAZY?!! Anyways, hey, where are you going? Don't you want to hear the rest of my story! Hey, you're SO un-Kawaii!!! Today, I have garbage duty with some boys named Ruke and Wuke. Weird names, I know, but they are something else. For starters, they are conjoined at the lower back. Of course, Wuke likes showing off his abs while Ruke is more reserved. They share a cell together and for good reason too, nobody wants to deal with their bickering! Ruke and Wuke look nearly identical, except for some minor details. Ruke has short to nearly no hair on his head and Wuke, well he has these sideburns that he constantly obsesses about. He has no hair other than his sideburns and his silly goatee that he pets like some sort of James Bond villain with you know, the cat. I feel like I am ranting since I've been here. Just constant nonsense on top of constant nonsense! And, garbage duty isn't glamorous by any means. We have to take care of these beige, flying four-legged lizards called Trash-eaters. Yeah, I know, what a great name, right?! Well, flattery asides, they are hard to take care of. I found out that the Trash-Eaters pretty much eat anything; plastic, sewage, meat, and so much other stuff. They stick too! But, I can get this place's efforts of being green. And, that's all I have to say about garbage duty. Nothing, but taking care of the flying, four-legged garbage disposal reptiles. Now, I need a bath! 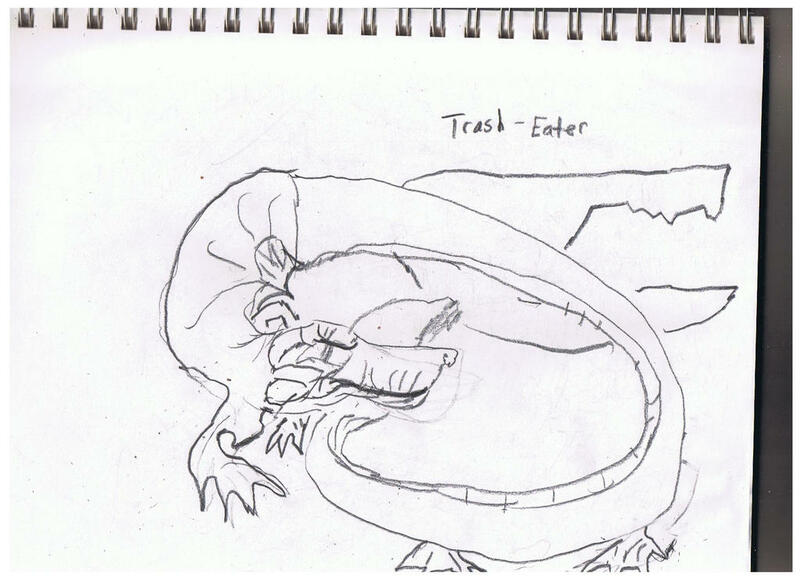 (If you are curious what a Trash-Eater looks like. Here's a general idea). Well, actually the prisoners can't die. Hardly anyone dies in the world, well stays dead. It's all about regeneration and they have a number tattooed somewhere on their chest about the number of times they were killed. The people that do stay dead for a long time are known as gods in that world. It's sort of inspired by Tuck Everlasting. But, it be hard to keep it tamed. Today in training, I learnt about this world, well the weapons. It turns out that there is more than Trash-Eaters, Lila, Ruke and Wuke and my centaur roommate, Belak. I know this, because one of the prisoners escaped. It's the first time, I've actually seen the guards. Let's just say, I prefer them when they are invisible. The prisoner that escaped was some girl named Lhel (pronounced La-El). She is probably the closest creature that I've seen representing a human other than that Suri-imposter. By the way, I am wondering what type mission she is on and when she'll be back. She like Matsuri seems like a really cranky individual that doesn't want to be messed with. Lhel, I learn from Lila was some sort of creature called Namuh. You can probably guess this is human backwards. She seems to be a master swordswoman, because she managed to knock ten of the guards out. They are massive! She seems to resemble Link, well a female version of him. Oh, I also forgot to mention, her 'elf' ears are a lot more pointed and sharp than Link. Her blonde hair is kept in a long braid, which is tucked under a beige cap. Her tunic is medium length and inferno red, which matches some cargo pants she wears. I've seen her before in the arena and she can actually hold her entire body while balancing on a broad sword. She can also levitate mere inches above the sword's blade while in a laying position. Most of the times, she's barefoot, but other times, she wears these beige 'bandages' around her hand-like feet. There's bad news! Well, on Lhel's part. She was recaptured. It turns out a military was sent after her, well that's everybody's whispering. I don't know if I can trust rumors. The lunch lady, Ms. Gag served us our food, well most of the food the Carnivores and Herbivores gathered. She's not pleasant to look at, especially since she places food on those outside of the two groups' trays. Those not apart of the Herbivores and Carnivores are pretty much screwed with just eating slime. I've been in that group and I HATED it! I literally barfed once I returned to my cell. Belak wasn't a happy camper, he kept me awake all that night with his slurred words and neighing. He kicked me out of my table-bed and wash the stuff up with that weird sanitation liquid I told you about. Apparently, Belak is a neat-freak, because he made me clean our entire cell from top to bottom, including the bars of our windows. Belak's lazy, because he just in his hay bed while he watched me break my back. If I did something he didn't like than he would topple the 'water' over and make me clean it up all OVER again. I didn't get a wink of sleep that night and when I finally tried to sleep, I was called out to the arena. Apparently, this was my first meeting with Lhel. She had an hour-glass shaped body and she apparently won the fight in the instant that it began, which I had no clue about. She pinned me to one of the walls and I saw a bright red tattoo on her neck. Her fangs were bared and her sharp claws were pointed towards my very neck. My heart skipped a beat that day! She threw me on the ground and walked away. I HATE TRASH-EATERS! Can you believe I was given one for a stupid, life or death race? But, guess what, nobody dies! We all come back. I found out from Lila that the stupid tattoo on Lhel's neck meant the number of times somebody has been 'killed' or 'died'. Of course, all of this happened after I told her that I met Lhel and right after that, she spat her juice or whatever it was she was drinking at me. It's sticky and it smells bad! And, it took me forever just to get the gunk out of my hair. I had to go to the barber's. Yeah, they have a barber in this prison, but whatever. The barber was a massive giant with a bald head and no face. He had an orange jumpsuit on and he had the tentacles of an octopus as his legs. He also used those slimy tentacles to shave my head. I got out alright, well barely! And, let's just say I am never going back! Belak is still my roommate, I guess the guards like making me suffer. Lhel is sharing a cell with Lila this time and they are next door to us. The chores around the castle are grueling. One of the Trash-Eaters, the one that has a crush on me had an accident. I am stuck with the sanitation liquid again and a simple mop. The yellow puke is nasty and it smells horrendous! Ruke and Wuke aren't making things easier. They are responsible with clean up duty like I am. Oh joy! Ruke keeps complaining, "Why do we have to clean up after your girlfriend, Moto?!" He would be knocked upside the head by his twin, Wuke, who seems to be the more sensible out of the duo. Ruke would then start arguing with Wuke, "HEY, WHAT WAS THE BIG IDEA?! Don't you have a sense of humor?!" It would then result in one of the guards cracking what I assume is a whip. Of course, you know by now, that the stinking guards around here are invisible and rarely appear. It makes the hairs stand on the back of my neck. I put the white hairs, yes, they are hairs. Hairs, I found out from Ruke are from some type of creature called a Lazlo. Lazlo is a creature with the head of a donkey and the body of a rat. They are said to be carnivores and usually the toughest prisoner is sent to kill one of them. That duty was up to Lhel and she gave the hide of the Lazlo to one of the other prisoners, Kazdan to use the bones and the hide for the different equipment of the prison. For example, the hairs of the mop like I mentioned prior is made from the Lazlo's tail fur. Apparently, Ruke and Wuke's mother, Echidna is in charge of raising the Lazlo. According to the twins, they are very, very difficult to control, their appetites especially. Ruke said, "Did ya know that ma's Lazlo, Hercules destroyed an entire village at one time. Man, ma was not happy and she had us scraping the prison's floor for an entire month for not looking after that beast." I asked Ruke and Wuke where their mother lived and they said outside of the dungeon. So far, I've only seen the forest and too many of these dank, dark rooms along with the arena. Why don't I just escape already?! This place is so weirdly demented! The fight between Lila and Lhel was intense. Lila hovered in the air and shot dozens of small projectiles at the Namuh. Lhel just kept skidding back on her long sword. The arena was in a full range of bloodlust. I was one of the people sitting on the sidelines watching all this take place. Lila growled as Lhel blocked her projectiles and sent them soaring towards her. The pink, floppy-eared creature hid the earth of the arena with a SPLAT. There was nothing gross though, because Lila was back on her feet or paws or whatever like Lhel's attack was nothing. Lhel kept her stoic expression and ran towards Lila with her long sword. Lila jumped on it and then kicked Lhel in the back of her head. The Nahum barely regained her balance. Lila snarled as soon as Lhel faced her. Lila jumped into the air again and released a loud screech with her tiny mouth. Lhel summersaulted through the air; evading the super sonic screams that seemed to tear up the arena as she jumped. She then stood her ground and hid her sword behind her back. Lila nudged her head and Lhel grinned. She then sent a huge blast of energy and pulled back her sword. The whole world seemed to falter then and there as Lila was knocked out again. She spiraled towards the ground and the whole arena shook like an earthquake. I was breathless! I wanted to run to the loud-mouth's side, but Belak held me back. "Tel Reh Lead..."
"Let her deal?" I asked. Belak nodded, "Ehs nac eldnah selfher." "She can handle herself?" I said and Belak nodded again. I just sighed with defeat and went back to my seat. Lila better be okay, she still owes me for stealing my lunch the other day. I held my head in my lap with my hands and just continued to growl. Could Moto not really be human? I ask, because he growls. Aside that, Lhel is one strong fighter. I can't help but wonder, how she fits into the prison, and how she wound up in it to begin with. At least, Moto seems to be handling this place really well, despite his neat freak roommate, who speaks backwards, and the slime, he has to eat. (sorry for my ranting, it's just I needed to let out some steam). It is chilly in the new cell they moved me and I am still in this prison! Belak and Lila, it turned out, they were just fakes. I don't know how, but it just is! It seems like one day, you dream that somebody is there. Somebody to get on your nerves and somebody to talk too; it's better than being alone. I woke up today and Lila and Belak just vanished! Lhel and the guards are still here, even though I can't see those beasts! Suri, well, the person that was an assassin or whatever just returned from her duty. I don't know where she went or who she killed, but the less I know the better. It seems like I am losing my mind in this place! I keep hearing a voice say, "The sea of trees is your prison! You cannot leave!" I feel like crying myself in a ball right now, but I just keep holding on. "Kaleb was a young kinght from my childhood dream. He rode a chestnut stallion everywhere he went through the dreaded dark forest. His horse and he were inseparable! Kaleb did his missions for the princess, whom he loved." "She didn't return his affections and Kaleb and his horse rode off into the forest with a heart full of sorrow. They came upon an old wizard that gave them shelter, but Kaleb fooled him." "Kaleb rode off in the morning sunrise with a bag full of the wizard's food and treasures. The wizard yelled and cursed the ground. Both boy and beast perished in it's murky abyss." Well, that's how my first dream went, pretty spooky, eh? That's just the beginning. It turns out that Lila was also based on a girl I knew from an old town I used to live in. She was quite the head-strong fighter as she never let anybody make fun of the silly, pink ragdoll she carried around. Her parents and her teachers worried a lot, because she always sent every fifth grader, forth grader, whoever dared to mess with her doll to the nurse's office. She made a lot of enemies and one day, Lila went through the woods surrounding our old elementary school to get home and she never emerged. Her stuffed ragdoll was found, but she was nowhere. I am beginning to thin this is all a dream, but I still feel hurt. I still have open sores on my bare feet. I thought in dreams, you're not supposed to feel pain. What's happening?! Thanks, but I'll have a hard time staying on the forums thanks to the weather and a faulty internet connection.